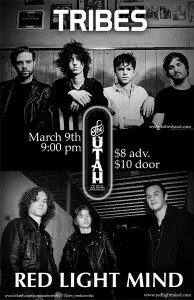 This Friday, make plans to come to the Hotel Utah in San Francisco for a killer show. Red Light Mind is performing with Tribes from the UK (they’re awesome), and debuting all of our new music. Get ready for something you’ve never seen before! This is our first ‘Frisco show of 2012, so we need all of you (and your friends) to come out and support! Plus, you’ll get to meet and hear Tribes, which you will not regret. This entry was posted in Uncategorized by redlightmind. Bookmark the permalink.